I've been inspired by all the artwork that has come home from my kids' classrooms this holiday and the use of white pastel, white crayon and pencil that I wanted to try something of my own. I came up with my diy paper snow globe place cards to use for Christmas dinner for a perfect blend of a white Christmas with a welcoming place card. 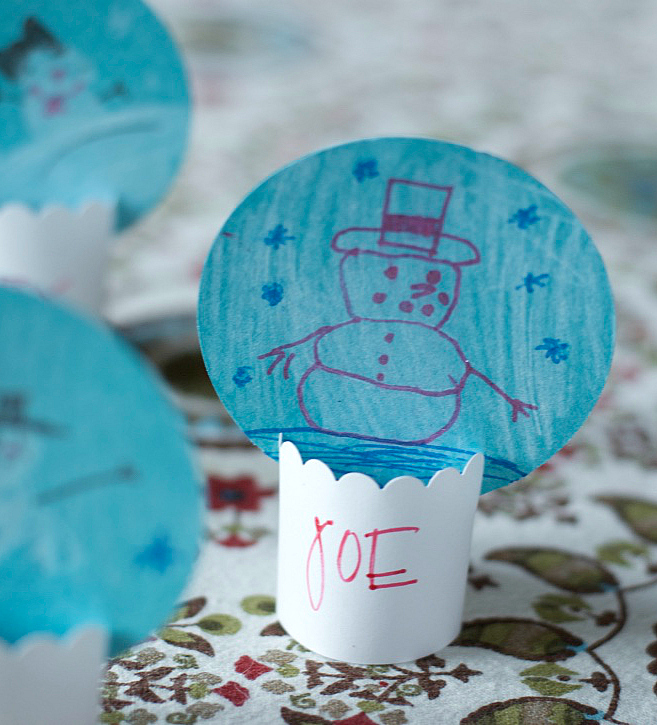 These little snow globe place cards are so easy to make and require just a few supplies. A variety of colors in the same medium you used for your snow OR jelly pens! Hooray for jelly pens! A writing pen for the names of your guest. If you use jelly pens above, by all means use these! Scissors. I love these scallop craft scissors. Start by punching your blue construction paper into circles. I used my 2.25" diameter paper punch and these are the perfect scale for a place card. Also nice for a garland! Now let the kids (or you!) make wintery scenes on the blue circles. Use white pastels, white crayons or white pencils to make the snow and gel pens for the details like snowmen, snowflakes, hills, dales and more. Next cut your paper bases with your scallop or regular craft scissors to about 1.5" high x 6" long. At the end of each end of your 6" rectangle cut a little slit - one on top, one on bottom - now put the two slits together to join your base into a circle. Write your guest's name on your paper rectangle base and cut a short slit on either side to slide your blue circle into for display.